Notes: Based on the simple little test kiln designed by Karatsu Pots (original blog post here), I made this little test kiln to begin testing some reduction firing techniques. The fire bricks I had on hand are battered and bruised so there's a fair amount of heat leaking. Future upgrades should improve on this although first firings have been promising. Propane fired and running for about 4hrs the first pieces reached vitrification at thin sections, however the thicker sectioned haven't matured. Before the industrial revolution, going back to medieval times and before, in Greek and Roman societies, marketplaces were characterised by the presence of local craftspeople selling their wares. During this time, the market place could only survive if the craftspeople attended to trade their goods. However, these marketplaces experienced a restructuring with the adoption of mechanised, mass production and today the attendance of makers, whether craftspeople or general labourers, is no longer a requirement for a thriving marketplace. Marketplaces have become more complex, offering a wide choice of products, and crossing vast lands to serve diverse populations. Craft and the mass market have had a tumultuous relationship since the development of these mass markets. Unable to satisfy the fundamental ‘mass’ scale of mass production, new materials and means of production have supplanted craft goods, a potent example being the practice of basket weaving that was almost entirely undermined by the plastic bucket. Competitions within the mass market play a key role in promotion and marketing and have an even greater importance for crafts. For many craftspeople, awards such as the Loewe Craft prize, form the basis of financial support for their work. While fundamentally unsuited to mass production, craft is well attuned to competitions for excellence, however to be eligible it needs to aspire to art; to move away from functionality and the interactions that we have with use objects and towards the meditative study of classical art and specifically sculpture. It could be argued that these awards do little to help crafts compete within the market as functional goods, and, however true this might be, this argument does little to identify what the optimum place and relevance of craft today is. While craft moves towards a less functional realm within the mass market, as artworks celebrating human activity, it’s worth looking again at how the tacit knowledge and skills inherent in craft can move beyond any previous conception of craft. Designers and producers are beginning to look at ways that craft techniques and traditions can benefit the mechanised production of goods, finding new relevance for the field along the way. These new ways of bringing the lessons from craft to the masses through mass-produced goods are unlikely to win any awards, and it’s likely, that like ergonomics, they will become taken for granted as they are standardised in line with market demand. Generative design has been making headlines recently as design software companies including Autodesk and architectural studios such as Zaha Hadid Architects continue to commit themselves to exploring its capabilities. Driven by computer aided drawing tools, generative design uses algorithms to optimise the forms of designs. Complex mathematical calculations are used to increase strength to weight ratios for example and subsequently reduce material use and improve efficiency. These sorts of benefits are central to the promise of generative design. By mimicking the efficiency and adaptability of nature, generative design tools will be capable of creating a huge number of forms that satisfy the requirements of a component or object, each only slightly differing for the last. Designers will be responsible for choosing from these forms and companies will adapt some of the lessons scientists and mathematicians have garnered from nature to create the proprietary software that designers use. Ultimately, generative design aims to remove the need for intuition and tacit knowledge from the manufacturing of goods and the workmanship involved in making goods. From the perspective of the those involved in manufacturing this makes sound business sense. The computer goes above and beyond the potential of a designer, giving them the super powers of an engineer, able to create every possible solution to a given need. In a promotional video expounding the future potentials of generative design, Jeff Kowalski, CTO of Autodesk notes the “…unprecedented reductions in costs, development time, material consumption.” Speaking over the image of a busy factory scene from the early 1900s, he explains that unlike traditional manufacturing methods, that “require you to make massive numbers of something just in order to be profitable”, generative design will allow just one technology, namely 3D printing, to create the optimum form for all products. In fact, generative design is really the first powerful embodiment of 3D printing technology, a technology that has for the most part failed to live up to expectations. Limited by low performance plastics the products of 3D printing have been suitable only for aesthetic, and novel applications. Granted despite these constrictions a few, magnificent, life-changing products have been realised, however the majority of 3D printed goods have been decidedly underwhelming. The materials available for 3D printers are developing however and it looks likely that performance materials, like steel and titanium will be more widely available in coming years. The allure of generative design is that it promises to provide designers with a program that will guarantee that the thing they print will operate to pre-programmed criteria. Analytical tools such as finite element analyses are standard plug-ins for computer aided drawing programs and can be used to analyse a given design, however they don't feed back into the design to optimise it as generative design does. This technology will find practical use in creating functional, load bearing or supportive objects and it's to be expected that the complex form of these components, parts and objects will finally justify the widespread adoption of 3D printing in manufacturing. Inevitably we will begin to see the metal manufacturing industry restructured under this technology. There will continue to be need for bar and sheet materials however for anything complex or structural, generative design and 3D printing can be expected to become competitive quickly. Part of the savings involved in using generative design and 3D printing will be in removing the need for specialisation in the field of tool making and fabrication. Rather than needing to communicate the design of a part to another person to make the part the designer can simply, and cheaply, print a plastic replica of the finished part. Computer analyses will contribute to the design of the object and confirm that the finished part will complete the given task. The specialist fabricator and engineer will likely be the first to go. No one can accurately predict the future, and these types of changes take time, however this could be the first real replacement for specialisation in metal manufacturing, or at least it will change what specialisation in metal manufacturing means. In relation to the products and services that metal manufacturing specialists currently service perhaps this is not such a bad thing, however the specialist job, and work, ultimately will cease to exist. Whether the promoters of this technology say it or not, we are moving away from skilled labour (inherently reliant on knowledge and intuition) towards unskilled labour, where every decision is correct, but some are better than others. There are serious questions about how we wish work to be in the future that begin to arise when looking at the promises made by the design software companies and architecture firms advocating generative design and 3D printing. As we redesign our world, and the systems in place to make this world, we should also be thinking of the effects of these developments on labour and manufacturing. A restructured system for metal manufacturing will require people to man the machines, and we should be careful to create jobs of value and purpose for the generations that follow. People love to hate it, and yet it's hard not to enjoy finding something you've wanted to buy at half price, and just before Christmas too. Considering the videos depicting sheer chaos, and the record of violent activity, that herald this international bargain festival, it's astonishing to believe that it's now accepted as another date on the calendar - but How does it work? Who takes part? and What does it mean beyond bargains? The first thing to keep in mind, is that a discount is a marketing tool - an incentive for shoppers to come to your store - and ultimately no discount aims to lose money. There can be discounts that come close to being loss leaders, selling products at a greatly reduced price that oblige the customer to return (think coffee machines here), or bundling products so as to seem to offer products for free. In the riskiest cases, it's likely that the retailer, and manufacturer, are still breaking even although they are waiving the profit in favour of publicity and new customers. It's a gamble that large retailers can play by leveraging their buying power to convince manufacturers to give them discounts and give them a massive advantage over smaller retailers, and they can do it all without breaking a sweat. It's a very different story for small and independent retailers who lack the buying power of international businesses. These shops and stores offer customers a very different shopping experience, and a range of products from other small businesses. This is the risk they have taken, with the hope that customers will enjoy their choices, and it's one that plays an important role in fostering businesses like mine. Unlike the deals negotiated around the mass production of goods generally available during Black Friday, a reduction in price of products for independent retailers is a direct reduction in income for those involved. As a manufacturer myself, I enjoy being able to pass on discounts to my customers through my online shop - it's something I can afford to do and I like to think that it makes my products even more accessible than they previously might have been. 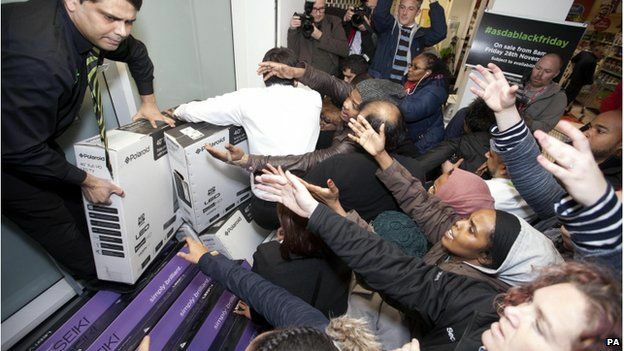 On a larger scale however I'm concerned by the influence Black Friday has internationally in encouraging people to buy. Discounts have become the norm, and as major low cost retailers in cities like Cork start to expand into mega-stores it's starting to seem that marketing has seized the market. We are encouraged towards the new and expensive with little regard to where these things come from or will go to - and it's getting increasingly hard to discern these things. Undoubtably the responsibility lies with us all as consumers in what and where we buy. 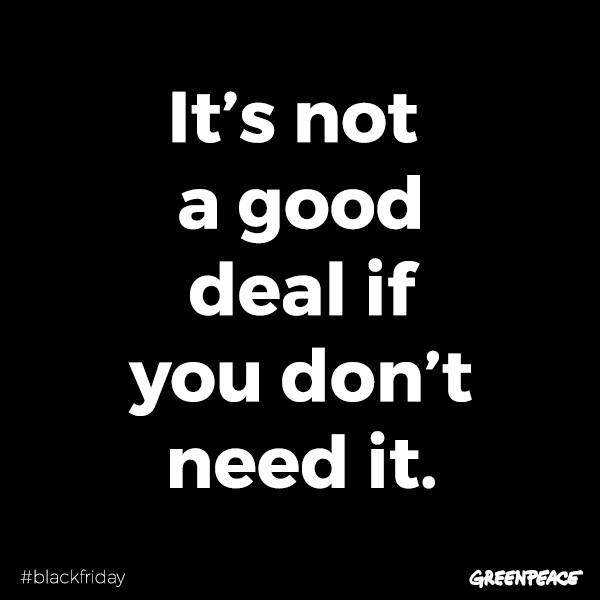 "It's not a good deal if you don't need it" is part of Greenpeace's Black Friday message, and it rings true in a world where throwing things away is causing major problems. This isn't a call to not buy things that you want, but a reminder that a TV, phone or an independently made and beautifully designed table lamp, are not just for Christmas, or even 2018. These are things that we should be able to live with for a long time, if not a life time, and if they're not then perhaps it's best to shelve that Friday feeling.